Not much to choose from on a short slate on NHL hockey action for Wednesday. North of the Border, the Toronto Maple Leafs will host the flatlining Ottawa Senators. The Senators can sometimes be worth a look at home where they’re 12-11-4 on the year but not on the road where their 7-17-1 away record is the worst in the NHL. On the other hand, no real interest in laying -300 with the home team either. That means we’ll head to Madison Square Garden and look at an old school Eastern Conference battle between the hometown New York Rangers and the Boston Bruins. The Bruins are having a markedly better season than the ‘Broadway Blueshirts’–Boston currently holds down the #5 spot in the East. They’re part of 7 team pack between the second and eighth spot separated by a combined 6 points so a few wins here or there could move them up the table quickly. No one will be catching Tampa Bay–the Lightning are 14 points clear of second place Toronto–but a second or third place finish in the conference is a very realistic goal. The Rangers are something of a mess at the moment though things are looking better than they did at the start of the season. New York opened the season 3-7-1 and has spent the time since trying to dig out of that hole. To some extent, they’ve been successful as they’ll enter this contest at 22-22-8. That still leaves them well out of the playoff picture, however, and they’re 9 points back of Columbus for the 8th and final playoff spot. The Rangers problem? They don’t really do anything well. They allow 2.75 goals per game against which is 27th in the league. They score 3.33 goals per game good for 26th in the league. Their power play is their team ‘strength’ hitting at 20.9% but that’s just 15th in the league. The penalty kill is at 77% for 25th in the league. To their credit, they’ve been playing hard and put up a decent effort in their past two games. They spotted the NHL best Tampa Bay Lightning a 3-0 lead on Saturday night before scrapping back into the game only to lose 3-2. They got shots on Louis Domingue but Tampa’s backup netminder was up to the challenge making 29 of 31 saves. On Monday, they led the LA Kings 3-2 late before Adrian Kempe tied it and Tyler Toffoli won it in overtime for the road team. This could be a flat spot for the Bruins who are coming off wins against other teams in the aforementioned ‘pack of Eastern contenders’ beating the Islanders and Capitals. They have a tricky series of home games coming up against Western Conference foes (LA, Colorado, Chicago) before they begin a very tough Western swing that could determine whether they finish near the top or bottom of the playoff pack. They’ve got games coming up at Anaheim, LA, San Jose, Vegas and St. Louis before they return home to face San Jose and Tampa Bay. Real tough stretch. Unlike most seasons, this game against the Rangers won’t motivate them much. The presence of Rangers backup goalie Alexandar Gorgeiev who will start here after Henrik Lundqvist started the last three makes it seem even less significant. 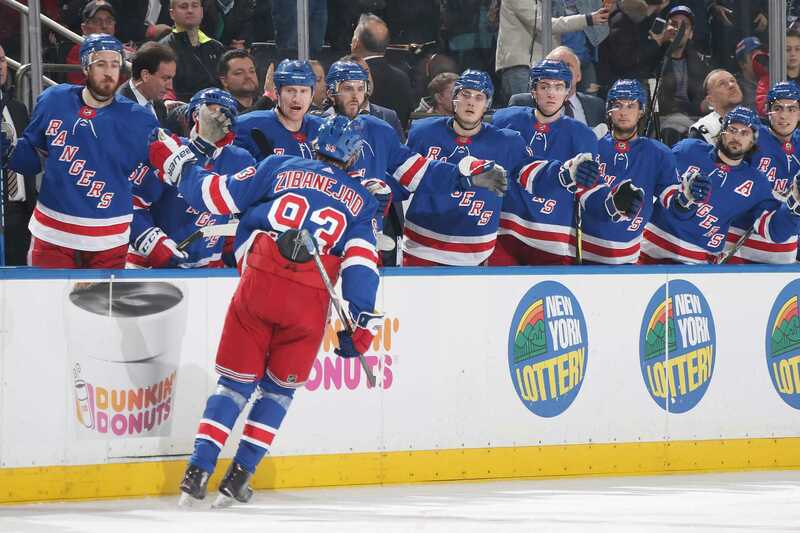 The Rangers have been playing hard of late and have been decent at Madison Square Garden all season with a 13-8-6 record on their home ice. The Bruins have been nothing special on the road at 11-10-4. No reason not to take a nice plus money price on the hard trying home side.